Today has been relatively easy. We were out all day - first going to church, followed by a second Thanksgiving celebration with Greg's family. Side note: Rowan received three movies as very early Christmas presents. One of the movies is a Thomas the Train movie that he has been quite literally aching to see. Rowan lives for Thomas the train. Not sure how I am going to handle this yet... Keeping him from this Thomas movie could prove somewhat challenging tomorrow! Rowan asked me "Mama, can I watch something?" almost as soon as he woke up. I decided that together we would bring out all the activities he and I can do over the course of the week and place them in a pile. We talked about our seven day challenge and that was that. Since then he has been contentedly playing with trains. Greg and I were able to go out on a date tonight thanks to a wonderful friend who babysat for us! Truth be told we DID go to see a movie. I guess we broke the no TV rule (does a movie in the theater count??) It was a very rare opportunity though! Rowan hasn't asked me about TV today. He is currently playing in a card table fort sporting a headlight. Before that he was living prehistorically playing with dinosaurs. So far, so good! Greg had taken six glorious days off and today is his first day back at work. So begins my days of entertaining the kids solo! I have delved into a book. I have been reading it every spare moment I get. I'm riveted. Tonight we did puzzles and played games to keep Rowan from getting into too much mischief. :) After Rowan went to bed Greg and I discussed playing a game, but instead we both conked out on the couch. That almost never happens! Guess we were tired and needed the sleep. The kids and I had a playdate this morning which definitely helped distract from the television set. Getting out of the house is always fun and makes things a little easier. I am noticing lots of "imagination play" and at times boredom. I think that the boredom is good though. Boredom can serve as a gateway to creativity. I am surprised that I am struggling somewhat with the impulse to keep Rowan entertained, but I think that's half of the problem we have had. I have had this misconception that my kid should be constantly busy doing something - anything, and never appear unhappy (ie bored). I am realizing that likely most of the time I have been projecting my own feelings rather than really interpreting his. The lessons we learn! We had MOPS today and therefore Rowan did watch some T.V. The end of the day is coupled with a movie so as to settle the children down. When we got home we did a couple puzzles, read books, and played games. Rowan is a "Trouble" pro now. He beat me fair and square! Today was a busy day. We were gone all morning and most of the afternoon. We had told Rowan that he could watch one of the movies he had received over the weekend despite our no television week. He had been extraordinarily patient all week waiting for it, so I felt fine granting him this reprieve. He loved it. Our challenge is concluded. My goal in all this at the beginning was to give up something that we rely on, but that really doesn't provide us with anything necessary. I appreciate the entertainment value of television, obviously - or we wouldn't have had an issue with it! When all is said and done the TV doesn't need to be on as often as it was. 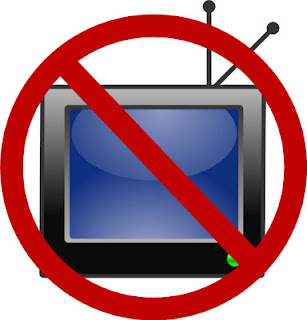 There were times throughout the week where I really wanted to turn the TV on and just forget the challenge! I will concede that I am glad we own a television, along with movies. It was a really good experience for us as a family to give it up though. Rowan has engaged in a plethora of activities and has really enjoyed himself. His requests to watch television have dramatically decreased. I have been reading on my down time which is much more engaging and entertaining than most of the programs that I was choosing to watch before. Greg has been spending his time doing other things as well! We have played games, talked about a myriad of things we're interested in doing together and incorporating into our family life. Overall, it was a good experience. I wouldn't say that I want to throw the television to the curb, but I would say that it is definitely going to change the way we have been using it. It will be less of a focal point and more of an occasional form of entertainment.